t*rexes and tiaras: She snuck out in that cotton dress..
Another typical Saturday outfit for me. I had some Amazon vouchers to use up recently, and as well as ordering a Fitbit (more to come on that at some point), I spotted this fabric and decided I would order some to make my very own version of the CK fish dress I'd been recently lusting after. 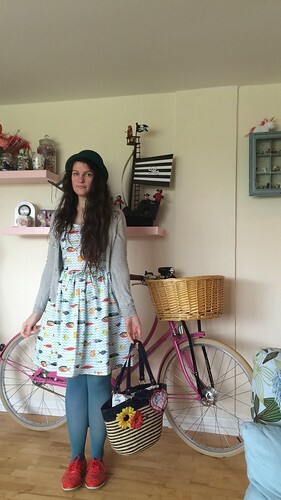 I used the Bette dress pattern again - a current favourite, it seems - and decided to embrace the colours in the print with the tights and shoes combination. 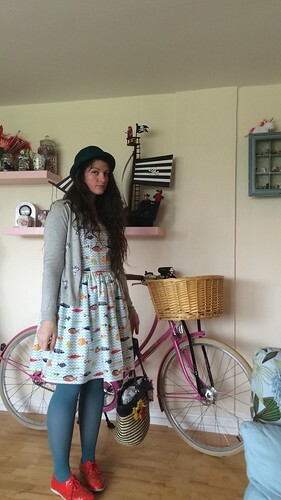 The hat was added purely to hide how dreadful my hair looked (the main reason I ever wear hats!) and I grabbed this bag because it was big enough to carry the parcels I had to post on my way into town. A bit of a mish-mash, perhaps. But I kind of liked how it all turned out. Thank you, I really liked the print.